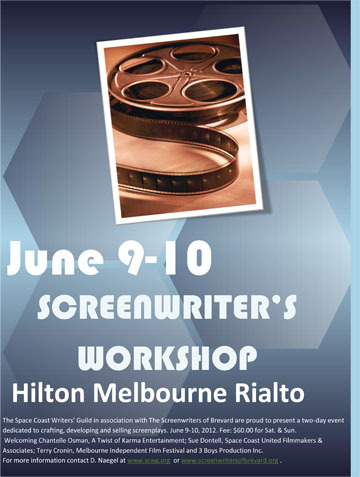 When: Saturday, June 9 and Sunday June 10, 2012. The workshop begins 9:00 AM and concludes 4:00 PM each day. Price: Early Bird rate $60.00 per person covers both days and will include a morning breakfast consisting of coffee, tea, assorted fruit yogurts, dried fruit, fresh berries, granola bars and sliced seasonal fruits accompanied by bottled waters and chilled fruit juices. Lunch & Dinner are not included. Seating is limited - register now to insure your spot. For more information contact D. Naegel, neg_lubbock@yahoo.com or visit www.scwg.org and www.screenwritersofbrevard.org . Good price for an opportunity like this. Seating is limited. After May 10th, the fee will be $70.00. Hurry, you don't want to miss this event. Register now.